A website launched last year – Britain from Above – boasts some unique perspectives on London among its more than 61,000 images including this one above of the South Bank site of the Festival of Britain – a national exhibition held at various venues across Britain as a post-war “tonic” for the nation – under construction, taken on 14th August, 1950. The website features images taken as part of a collection of aerial photographs taken between 1919 and 1953 by pioneering air survey company Aerofilms Ltd. It has been created by English Heritage, the Royal Commission on the Ancient and Historical Monuments of Scotland and the Royal Commission on the Ancient and Historical Monuments of Wales following their joint purchase of the company’s collection of more than 1.26 million negatives and 2000 photo albums and forms part of a four year project which aims to conserve and digitise some 95,000 of the oldest and most valuable photographs in the collection. Under the project, the general public is invited to share and record their knowledge and memories of the photographs featured. To get involved, head to www.britainfromabove.org.uk. 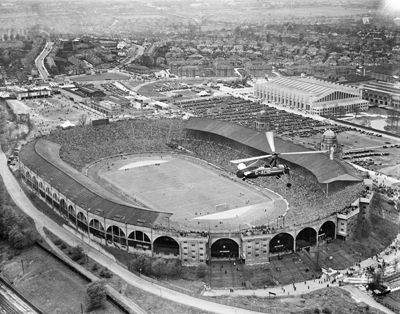 Below can be seen an image of the FA Cup Final being played between Sheffield Wednesday and West Bromwich Albion (Sheffield were 4-2 victors) at Wembley Stadium on 27th April, 1935. PICTURES: © English Heritage. Aerofilms Collection EAW031792/© English Heritage. Aerofilms Collection EPW046905. Former tea clipper Cutty Sark is finally nearing the end of £50 million restoration project in its dry dock at Greenwich. 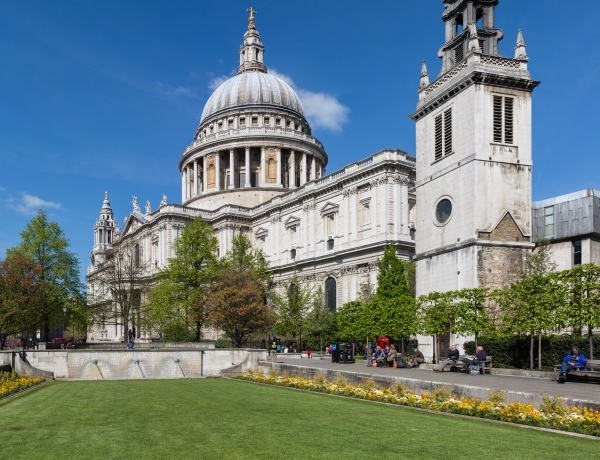 The ship, almost destroyed in a fire in May 2007 which broke out while the ship was undergoing conservation work, is expected to reopen to the public next year – just in time for the Olympics. 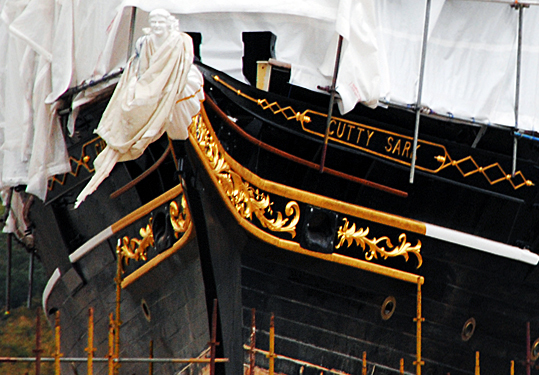 The extensive restoration project recently marked the completion of the ship’s intricate gold leaf “gingerbread”, located on the upper hull on either side of the bow, and the figurehead (pictured). The Cutty Sark undertook her first voyage – to Shanghai – in 1870 and continued to ply the waters between China and the UK until 1878 when steamships took over the route. The ship continued, however, to operate as a cargo vessel (including hauling wool between Australia and the UK) until the early twentieth century when she was eventually restored and used as a training ship. The Cutty Sark, which last went to sea in 1938, came to London in 1951 as part of the Festival of Britain celebrations. She was saved from the scrapyard in 1954 when she took up her position in the drydock at Greenwich and was opened to the public in 1957. For more – including a diary of the restoration work – see www.cuttysark.org.uk. A sleek, futuristic, cigar-like sculpture that resembled what early science-fiction writers thought space-craft would look like, the Skylon was the centrepiece of the 1951 Festival of Britain site in South Bank and remains the enduring icon of the post-war celebration. Designed by young architects Hidalgo Moya and Philip Powell (with the assistance of engineer Felix Samuely), the 300 foot tall Skylon, which, supported by cables, seem to hang in the air over the Thames, some 40 foot above the ground. 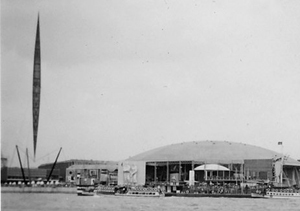 The structure (seen on the left of the picture of the Festival of Britain site) was dismantled in 1952 on the orders of the then-Prime Minister Winston Churchill who apparently saw it as an unwanted symbol of Clement Attlee’s Labour Government which had lost power earlier that year. 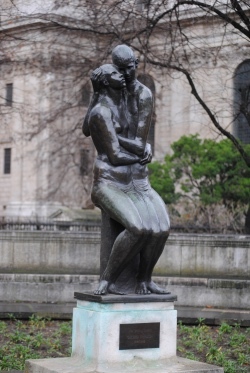 Strangely, the fate of the structure remains something of a mystery – Jude Kelly, artistic director at the Southbank Centre describes it as being “like the Loch Ness monster” in an interview with the Guardian newspaper earlier this year. “People have sightings of Skylon – they think – and bits of it, but nobody really knows what happened to it,” she said, adding that it was very hard to understand why it was thrown away. While some fragments remain – including the base (and a model of it) which can be found at the Museum of London – a common theory is that the rest of it was cut up and dropped into the Thames while other theories have it being buried under Jubilee Gardens or simply sold for scrap metal and “turned into ashtrays”. There is an ongoing campaign to have the Skylon, which these days lends its name to a riverside restaurant at the Southbank Centre, rebuilt, although not necessarily in its original location. 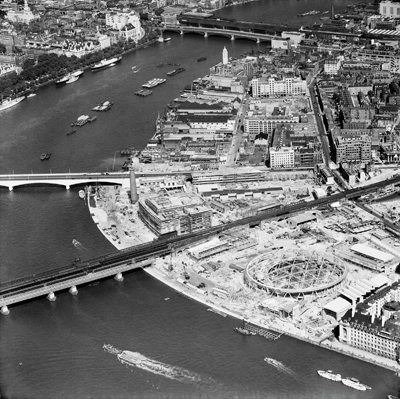 The story of the Skylon, which sat on a site now occupied by the Southbank Centre, is told in the Museum of 1951 (see Southbank Centre website for details), open as part of the celebrations of the 60th anniversary of the 1951 Festival of Britain. On Tuesday, architect Nicholas Grimshaw and former president of the Royal Institute of British Architects Jack Pringle will lead a discussion at the Southbank Centre on the Skylon. For more information, follow this link. 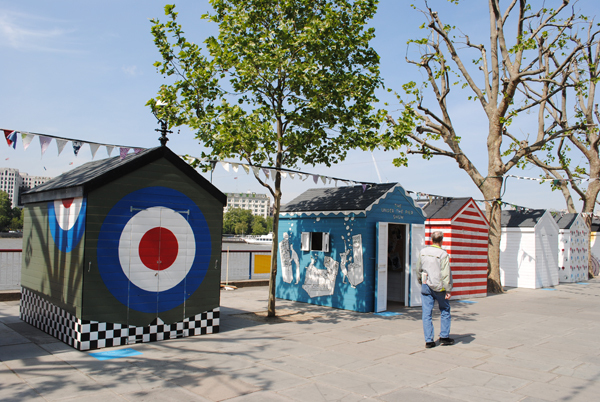 Beach huts overlook the Thames at Queens Walk, Southbank, in celebration of the 60 year anniversary of the 1951 Festival of Britain. The huts have been individually designed by artists and reflect an element of life by the seaside – from an exhibition of vintage swimwear to a gallery of visual art which recalls when a storm surge flooded much of the North Sea coast in 1953. Nearby is an “urban beach” where you can pause to play in the sand. The huts will remain in position until 4th September. For more on the Festival of Britain 60th anniversary celebrations, see www.southbankcentre.co.uk.